Readers. Readers. We at FastCompany like to think of ourselves as the Information Booth at the top of Mount Idea, trumpeting the innovation of others to the world at large. And perhaps it is time to salute, the innovation used in the language of Sarah Palin. When one of her tweets contained the neologism, refudiate, numerous attempts were made to sully her name. She tweeted back, “Hey, call me Shakespeare.” So everyone did, using the hashtag #Shakespalin. 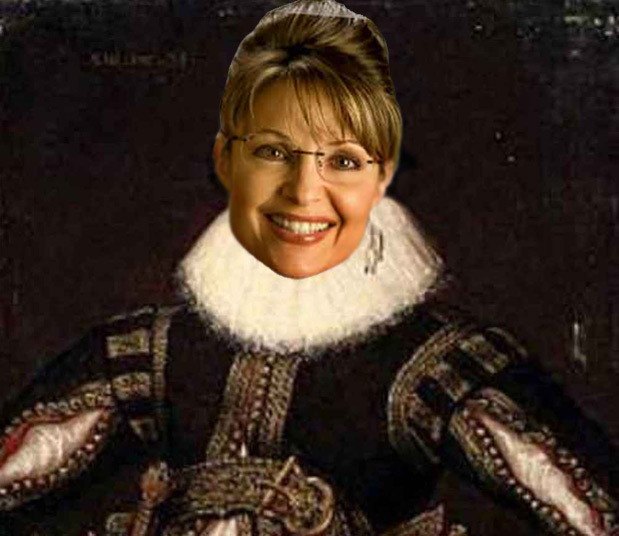 Soon, the Twittersphere was filled with Shakespearean pastiches –favorite by far: “Shall I compare thee to a Tina Fey?” So, to Mrs Palin and her creative veriosophy, here is FC’s hommagination to the queen of the teabaggers, a special, open letter. We at FastCompany.com are fans of innovation. And you, Sarah, are the most innovationist of them all. Not only with your maverickian stance on language, but the fact that you are bidding to be the first female in U.S. history to be both presidentialator and Innovatista. Case in point, your kids’ names: Trig, Bristol, Pup, Skisledge and Hambone (copy editor: please check spelling on those last two). If that isn’t innovation, I am a banana, albeit a left-handed one. Sure, we can attribute the clever names to your Bachelorette of Arts in Communications (with minor in Journalingo), but the real source of brilliance is your fertile imagina. In fact, the closer we examine your life (via Wikipedia entry), the more we realise just how much you and Shakespeare have in common. Perhaps a rogue bit of DNA was carried on the wind from late 16th-centurion England over to America. A Shakespore, if you like. It’s this bit in your Wiki entry that gets me. It’s augury on a par with Julius Caesar–and I think we all know that dude did more than just invent an awesome salad. Your way of doing it may be less messy than chicken entrails, but it’s just as effectivatious, Sarah. But perhaps to make the comparison complete, we should look at your prodigatious literary output. You’re on the right track: two books so far: Going Rogue; and America By Heart, in just over a year. A rate that may not rival Shakespeare’s output of thirty-eight plays and 154 sonnets, but your Twitter Stream is pretty poetical, so that counts. Like Shakespeare, you’re not appreciated in your time. It took him a bunch of centurions for him to get the recognition he deserved. Give us two hundred years and Palinspeak will rival Esperanto in popularity. That’s a promise we won’t break so long as we live and breathe.